This one-hour webinar provides an opportunity to familiarize the SLP with Fiberoptic Endoscopic Evaluation of Swallowing (FEES) and Modified Barium Swallow Study (MBSS). The risks, strengths, and limitations of each exam are outlined. Research comparing the two instrumental exams is discussed. Case examples are provided as an exercise for clinical decision making. Risk factors associated with aspiration pneumonia are reviewed. If you wish to have your participation in this course reported to ASHA, you must include your ASHA number when registering for the course. If you do not wish to have your participation submitted to ASHA, type “NO” in the field requesting your ASHA number. Once the course post-test has been completed your material will be ready for us to submit. We submit participation to the ASHA CE Registry within 45 days of the last date of the quarterly offering. Describe the fundamental differences between FEES and MBSS. 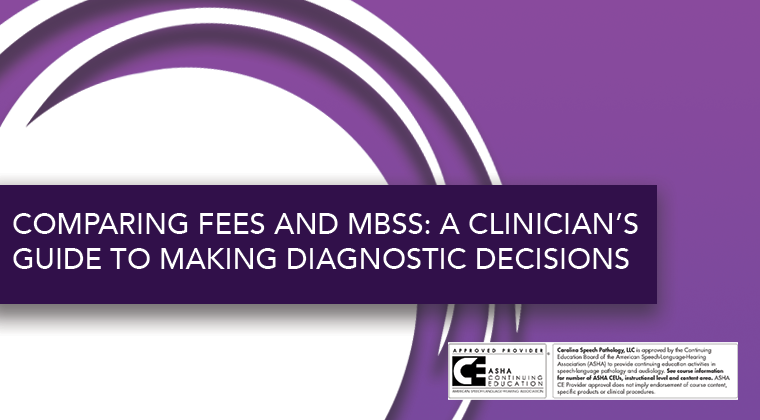 List the strengths and limitations of FEES and MBSS. Make appropriate decisions for swallowing imaging studies. Identify risk factors which may be associated with aspiration pneumonia. 00:10-00:20: What do we see with these exams?